The natural gas pipeline giant made several strategic moves as it started recovering from a disastrous performance in 2015. Kinder Morgan (NYSE:KMI) entered 2016 on shaky ground. The energy infrastructure giant's stock price got pummeled during prior year due to concerns about its balance sheet as its leverage ratio crept up to 5.9 times debt-to-EBITDA. Those anxieties forced the company to take swift action toward the end of 2015, with it slashing the dividend 75% to get back on more sustainable footing. The company continued taking action last year by announcing several strategic transactions to alleviate more pressure. That discount, as well as several looming catalysts, suggest that the stock still has plenty of upside in 2017. While Kinder Morgan's decision to significantly reduce its dividend in late 2015 provided it with ample cash flow to finance its near-term growth capex, the company still had to figure out a solution to refinance upcoming debt maturities. The company found that solution in late January when it closed a three-year $1 billion term loan and a $1 billion expansion of its credit line, which increased from $4 billion to $5 billion. That incremental liquidity provided the company with the capital it needed to refinance these maturities without accessing the capital markets. In addition to that, the company carefully examined its existing portfolio and project backlog to high-grade both. Those efforts resulted in the canceling of two large projects with less-than-ideal economics and the decision to monetize several other assets. The most significant transaction was a strategic joint venture agreement with utility Southern Company (NYSE:SO). Under the terms of that agreement, Southern Company paid Kinder Morgan $1.47 billion in cash for a 50% stake in the Southern Natural Gas pipeline system while also assuming 50% of the system's debt. That agreement meaningfully reduced Kinder Morgan's leverage, which was expected to fall below 5.3 times at the end of last year, well below its original year-end target of 5.5 times debt-to-EBITDA. This series of strategic moves put the company back on a path toward financial sustainability. Further, the company accomplished this objective while avoiding high-cost debt and equity transactions. As a result, the company entered 2017 on solid financial ground. Kinder Morgan outlined its 2017 financial expectations in early December, forecasting that it would produce $4.46 billion of distributable cash flow. It intends to use the bulk of that money to finance $3.2 billion of expansion projects and pay its current dividend rate, while still generating excess cash for further debt reduction. As things currently stand, the company expects to end 2017 with a 5.4 times leverage ratio. However, that should fall below its new 5.0 times target in 2018 after completing its current slate of expansion projects. That would put the company in the position to deliver a significant dividend boost in 2018, with many analysts seeing the potential for a more than 100% increase. That said, there is upside potential to the 2017 plan. For example, Kinder Morgan currently intends to joint venture its recently approved Trans Mountain expansion project. The company fully expects that such a transaction will enable it to recognize the value created in developing the project thus far. Such a move would follow the blueprint laid out by fellow pipeline companies Energy Transfer Partners (NYSE:ETP) and Sunoco Logistics Partners (NYSE:SXL), which agreed to sell a 36.75% stake in their $4.8 billion Bakken pipeline for $2 billion. That math worked out so that Energy Transfer Equity and Sunoco Logistics stand to capture a 5% premium on the project's cost or $236 million in value. A similar monetization transaction by Kinder Morgan for Trans Mountain could bring in quite a bit of cash and accelerate debt reduction. In addition to that, Kinder Morgan also intends to pursue similar joint venture transactions for several other projects in its pipeline. If these efforts prove successful, it could further accelerate the company's deleveraging. Finally, the company's 2017 plan assumes oil averages $53 and that natural gas is around $3. However, most analysts see oil prices in 2017 averaging $55, with several even more bullish, while natural gas prices have run well above $3 in recent weeks. If those higher prices play out in 2017, it will supply Kinder Morgan with some incremental cash flow, providing more upside for the stock. 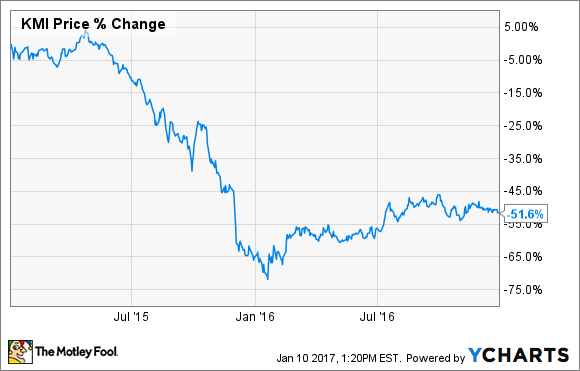 While Kinder Morgan's stock enjoyed a nice run in 2016, it is still more than 50% below the peak. This discount suggests that the stock could continue climbing in 2017, especially if it completes several joint ventures and commodity prices rise above projections. Meanwhile, the icing on the proverbial cake would be if those catalysts enable Kinder Morgan to provide investors with an unexpected dividend boost before the end of the year.